Click the button below to add the Copper Range Hood '0209' to your wish list. A kitchen furnished with a decorative range hood will add value-added component to the home decor. Hood '0209' is made of hammered copper and available in wall mount and island version. Its finishing can be customized for honey, rustic natural, coffee and antique patinas. The model on the image was made to order in light coffee color. It was decorated with coppers straps nailed into the body. This decorative range hood can be manufactured insert ready for any brand ventilation equipment. Select $200 custom work in the menu to have it prepared for your own insert. As a low budget alternative, buy this appliance with a simple 200CFM ventilator, light and filter already installed. Rustica House recommends contracting a contractor for the range hood installation. 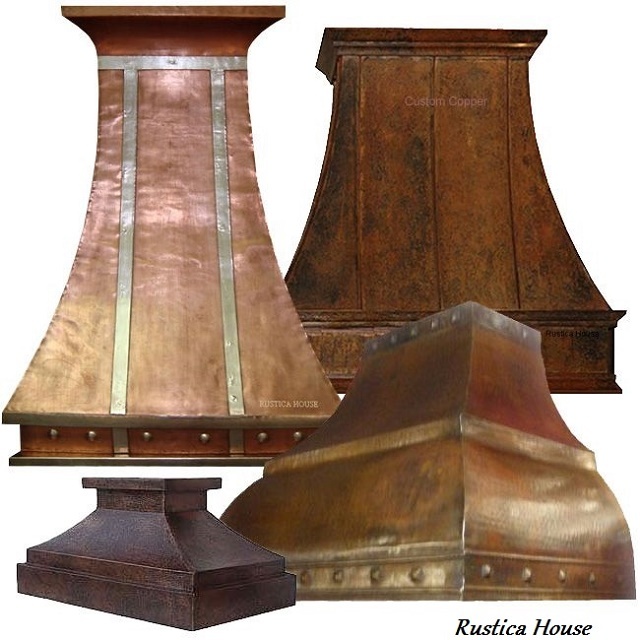 Caring for the decorative copper range hood is not difficult nor time consuming. Do not use to clean copper abrasive cleaner, a brillo pad nor sharp brush. Clean instead with hot water and scrub with a soft nylon brush. When finished dry the it with a soft cloth or paper towels. Avoid contact with acidic food and citric fruits. They might discolor the metal. If that happens search the web for information about how to repair patina.